The Lower Devonian Rhynie chert is known mainly for its fossil plants and creatures but it may also reveal ample information on the succession of processes which had been going on before and during silicification. 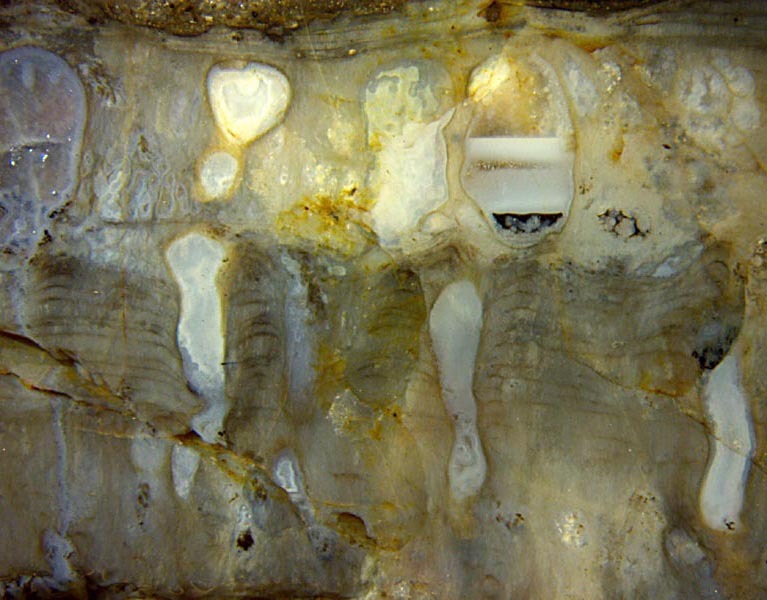 Fig.1: Rhynie chert, bubbles forcing their way through microbial layers before or during silicification. Width of the image 10mm. Most conspicuous in Fig.1 is the former cavity filled with chalzedony levels and quartz above. The level fills were deposited when emulsions had formed in the water-filled cavity. The the black deposit with its slightly wavy surface poses a problem which will not be considered here. As one may guess, the now filled cavities once had been gas bubbles in water. Above and below the watery stratum with the broad bubbles there are layer stacks of another type: nearly horizontal, doubtless of microbial origin, continuous and locally eroded above but penetrated by tube-like cavities below. It is not known whether or in which way their formation is related to the upright growth of microbial filaments of a few µm thickness, seen in Fig.2 when in bunches. The similarity to the filaments of the cyanobacterium Croftalania venusta, whose prolific stands are there in the same chert sample, had been noticed before by  in connection with a sample apparently quite similar to this one . Fig.2: Filamentous cyanobacteria grown upright through formerly horizontal layers, the latter sagging beside bubble pathways right and left. Width of the image 1.8mm. 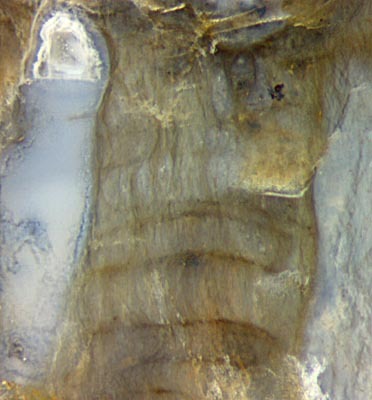 Fig.1 suggests that gas generated below had forced its way through the stack of microbial layers until it ended up in the watery stratum above where it accumulated into wider bubbles which got stuck there. The previously horizontal layering is seen deformed near the vertical tubes left in the wake of ascending bubbles. Here, surprisingly, an apparent paradox arises: The ascending bubble should have pushed up part of every layer while forcing its way through. Hence, one expects to see some residual upward bend of the layers at the tubes but the bend is downward. The essential part of this unexpected phenomenon may become comprehensible by means of a thought experiment: Imagine a horizontal surface of a material with extremely low elastic modulus, like gel prepared with gelatine and much water. Let a vertical cylinder be cut out. This takes the pressure away from the cylindrical cavity wall whereby the gel shifts inward and downward under its own weight until the mechanical equilibrium is restored: If initially it were marked by straight lines, one would see them sagging near the cavity, similar as in Fig.1. The less easily imaginable first part of the phenomenon, performed by the ascending bubble making a tube-like cavity into a material with obscure rheological properties, has not been considered here. Any attempted explanation of what was going on at the earliest stages of the solidification which finally produced the Rhynie chert should take into account that the material properties of complex systems like this one, with densely spaced aligned filaments more or less coated with organic or inorganic gel, floating in water or partially sticking to each other, are expected to deviate from those of common liquids and solids.